The Oregon Dunes National Recreation Area is located on the Oregon Coast, stretching approximately 40 miles (60 km) north of the Coos River in North Bend to the Siuslaw River in Florence, and adjoining Honeyman State Park on the west. It is part of Siuslaw National Forest and is administered by the United States Forest Service. 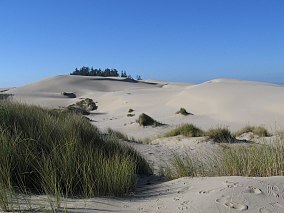 The Oregon Dunes are a unique area of windswept sand. They are the largest expanse of coastal sand dunes in North America and one of the largest expanses of temperate coastal sand dunes in the world, with some dunes reaching 500 feet (150 m) above sea level. They are the product of millions of years of erosion by wind and rain on the Oregon Coast. The Oregon Dunes National Recreation Area provides numerous recreational activities, including off-highway vehicle (OHV) use, hiking, photography, fishing, canoeing, horseback riding, and camping. The Carter Dunes Trail and Oregon Dunes Day Use provide forest access for the disabled. Frank Herbert's science-fiction novel Dune was inspired (in part) by the author's research and fascination with the area. The Oregon Dunes are over 100,000 years old and stretch approximately 40 miles (60 km). The youngest dunes, which are the closest to the ocean, began forming about 7,000 years ago. Studies of individual sand grains show that these sands were carried down from the mountains by the Umpqua, Siuslaw, and other smaller rivers. In 1963, Congressman Robert B. Duncan introduced a bill to establish a national seashore at the Oregon Dunes; it unanimously passed the Senate Interior Committee. Senator Wayne Morse opposed provisions of the bill that increased environmental protections by restricting property uses. In 1972 Congress set aside 32,186 acres (13,025 ha) of the total dune area as the Oregon Dunes National Recreation Area. The actual dunes are managed by the U.S. Forest Service, while the remaining area is private or county land. The sand dunes were formed by wind and water over time. The dune formation is mainly dependent on the wind. In the summer the wind blows from the north and northwest at 12–16 miles per hour (19–26 km/h). Mountain barriers near the coast deflect the wind currents, forming the sand into many different shapes. In the winter the winds are much slower (except during storms when the winds can reach up to 100 miles per hour (160 km/h)), coming from the south and southwest. These winds move large amounts of sand, reshaping the dunes' structure. Water also plays a role in dune formation. Waves and tides dredge sand from the ocean floor and deposit it onto the beaches, where the wind takes over. The water currents also create marshy areas where standing water is several feet deep. Upward pressure causes the sand grains to become saturated and float. This process results in quicksand. Quicksand is found in the low, unvegetated areas between the dunes. The barrage lakes are the largest lakes in Oregon Dunes National Recreation Area. They were formed when streams flowing west from the Coast Range foothills were dammed up by the rapidly developing dunes. Stable native plant species are vital to the success of the dunes ecosystem. Several native plants and plant groups have been identified as crucial and are part of active management and conservation efforts. These plants include red fescue, Port Orford cedar, evergreen huckleberry, seashore bluegrass, shore pine, hairy manzanita, bearberry, bog blueberry, tufted hairgrass, slough sedge, Sitka spruce, and skunk cabbage. Original native plant species were drastically reduced over the years due to the planting of European beachgrass, Scotch broom and shore pine for sand stabilization that occurred from 1910 through 1979. Many species of birds live in the varied habitats of the Oregon Dunes National Recreation Area. The South Jetty area includes beach, marsh, and coastal wetlands where the tundra swan, marsh wren, Canada goose, yellow-rumped warbler, red-tailed hawk, sanderling, long-billed curlew, dunlin, and least sandpiper make their home. The great blue heron, American bittern, green heron, Virginia rail, cinnamon teal, common yellowthroat, common merganser, belted kingfisher, snowy plover, bald eagle, and osprey live along the Siticoos area by the Waxmyrtle Trail. The Eel Creek area includes many shore pines and provides shelter to the pine siskin, chestnut-backed chickadee, Swainson's thrush, wrentit, northern flicker, red crossbill, olive-sided flycatcher, and Anna's hummingbird. The white-tailed kite, northern harrier, violet-green swallow, downy woodpecker, orange-crowned warbler, yellow warbler, black-throated gray warbler, Townsend’s warbler, hermit warbler, great horned owl, and great egret have been sighted in the Horsefalls area. The western snowy plover uses the Oregon Dunes National Recreation Area as a nesting site. In 1993, it was identified as a "threatened" species by the US Fish and Wildlife Service, with only 68 birds remaining in Oregon. Multiple agencies used a multi-pronged approach to protect the plovers and increase their numbers. Techniques included restoring the plover habitat along the sand dunes by removing invasive beach grasses and maintaining the appropriate structures optimal for nest building. Protection of nesting sites is achieved by education, signage, and beach restrictions during the nesting season from March 15 through September 15. When necessary, these restrictions are enforced by police officers. Other techniques include removal of predators and accurate population monitoring. As of 2012, the number of plovers had increased to 403 birds. The Oregon Dunes Restoration Collaborative is an organization that works with numerous government entities to preserve and restore the dunes. The group, formed in 2014, is engaged in efforts to combat the spread of invasive plant species that consume a large portion of the dunes. The invasive species seen today are a result of a twentieth-century effort by land managers to stabilize the dunes by planting grasses. While these grasses were successful in stabilizing the dunes, they have flourished to the point where they interfere with the natural shaping of dunes. Today the group, along with the United States Forest Service, is creating prioritization plans, locating funding sources, and raising public awareness of the project. The group encourages individuals to volunteer in engagement and stewardship initiatives around the dunes, employ sustainable recreation practices while visiting the dunes, and engage others about the current issues involving the dunes. The Oregon Dunes National Recreation Area is among the top United States Forest Service sites in the country for off-highway vehicle (OHV) use. Until the first management plan was adopted in 1979, 91% of the site was available for the use of OHVs. A revised 1994 Recreation Use Plan restricted the use of OHVs to only 31% of the total site, split between two large units or "Management Areas." As of 2018, visitors can use the North, Middle, and South OHV riding areas. Banshee Hill is the highest dune in Oregon Dunes National Recreation Area at 500 feet elevation. ^ "Land Areas of the National Forest System" (PDF). Retrieved 2012-04-22. ^ The Road to Dune (2005), p. 264, letter by Frank Herbert to his agent Lurton Blassingame outlining "They Stopped the Moving Sands." ^ a b c d "Oregon Dunes". Oregon Encyclopedia. Retrieved 2018-11-12. ^ "Solons pass Dunes bill". The Oregonian. November 22, 1963. ^ a b USDA. "Geology of the Dunes". ^ Christy, John A., "Rare Plant Associations, Oregon Dunes National Recreation Area, Sutton Recreation Area, and Heceta Sand Dunes ACEC/ONA" (2013). Institute for Natural Resources Publications. 7. ^ a b Stein, Marty (June 12, 2015). "Survey for sand dune endemic species in the Oregon Dunes National Recreation Area" (PDF). Interagency Special Status Species Program FY 2014 Inventory and Conservation Planning Project. ^ "Birds of the Oregon Dunes National Recreation Area". Retrieved November 6, 2018. ^ Todd, Laura; Elbert, Daniel (January 2014). 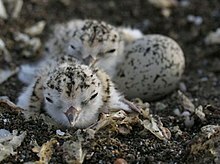 "Western Snowy Plover in Oregon: Community Creates Recovery". Northwest Science. 88 (1): 58–60. doi:10.3955/046.088.0112. ISSN 0029-344X. ^ "Oregon Dunes Restoration Strategy" (PDF). Save Oregon Dunes. Oregon Dunes Restoration Collaborative. Retrieved 11 November 2018. ^ United States Forest Service. Off Highway Vehicle (OHV). Oregon Dunes National Recreation Area, Oct. 2010, www.fs.usda.gov/Internet/FSE_DOCUMENTS/stelprdb5281879.pdf. 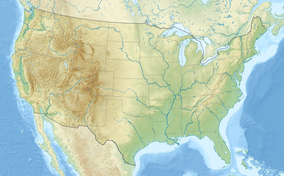 Wikimedia Commons has media related to Oregon Dunes National Recreation Area. This article related to a protected area in Oregon is a stub. You can help Wikipedia by expanding it.